‘DIGIDENTITY’ explores the influence of social media, with a focus on Instagram, considering how it encourages users to perfectly construct and manipulate information about themselves. 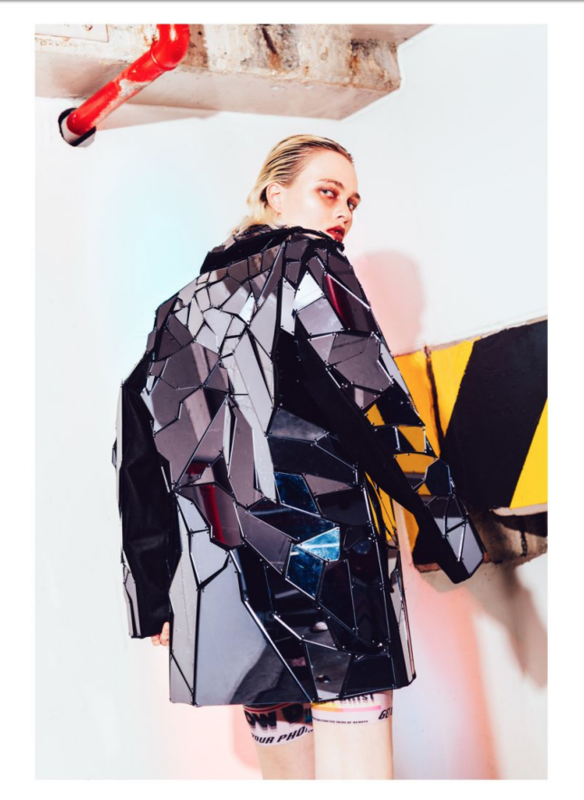 This collection investigates the idea of the ‘true’ and ‘false’ self through juxtaposing silhouettes and contrasting textures paired with highly distorted, custom digital prints and texturally-driven layered fabric manipulations. Extreme graphics feature in the collection, including morphed Instagram feed-inspired prints, custom static and ‘standby screen’ textures, hand-embroidered 3D faces and laser cut mirror acrylic and holographic fabrications. DIGIDENTITY aims to hold a mirror up to current times and reflect back our flawed society.